Goodbye, winter! : Now that the cold season is finally coming to an end, it’s a good opportunity to assess the progress you made and obstacles you encountered these last several months. Record the lessons you’ve learned so that your garden is even better the next time winter rolls around. While you’re thinking about it, plant some cold-weather favorites now if you’d like to see more bark and berries next season. Transition: Out with the old, in with the new! There are many ways to transition your garden to spring after a long winter. Crop lawns closer to the ground to remove old growth. Substitute tired mulch with a fresh layer. Refresh your compost and add four to six inches of organic material to soil at a time. Rust: You may notice that rust has started to develop on some of your gardening implements and yard furniture while pulling them out of storage. Treat this problem by removing rust with steel wool and covering permanent damage with rust inhibitive paint. Remain aware: Be flexible. Frosts can still endanger plants so evaluate the conditions before leaving your garden entirely vulnerable to the elements. You’ll want to begin removing winter protective coverings from plants but wait until the weather accommodates. When it does, clean coverings and other winter items before storing them in dry areas; they’ll be in good shape when you reuse them next winter. 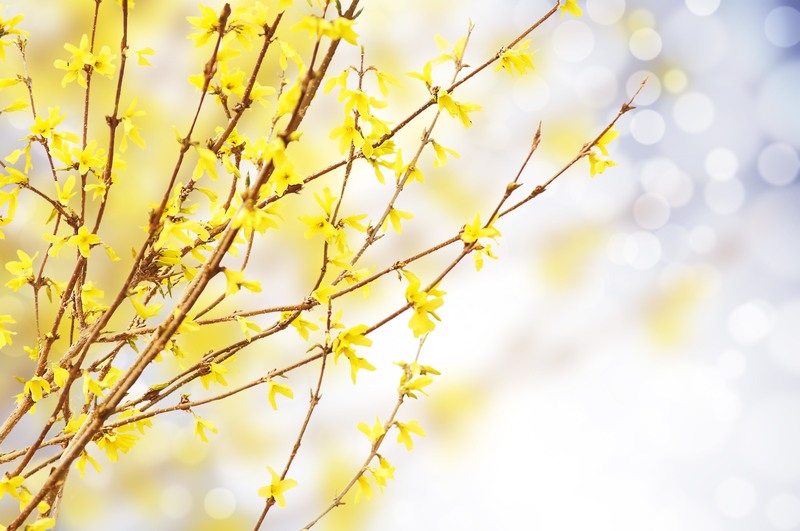 Spring accessories: If weather permits, replace protective winter items with fun spring accessories, such as furniture, bird feeders, and garden art. Take what you need out of storage and go shopping to fill in gaps. Try to organize as you go and trash anything you no longer need, whether it’s damaged beyond repair or expired. Spring plants: Consult gardening notes, lists, and diagrams if you have them because planting season is here! With everything you know about your yard in mind, including past successes and failures, browse trees, shrubs and perennials in search of good additions to your garden. Start looking as soon as warm-weather plants are available so that you can take advantage of the best selection. Mail-order plants: If you’ve received any plants by mail, help them adjust painlessly to their new home. Unwrap dormant plants as soon possible. Roots need moisture and the plants themselves need a cool environment, so store mail-order plants in an appropriate place until the weather’s nice enough for planting. Start seeds: Get the ball rolling this season by starting seeds indoors. The climate is warming up so check which varieties qualify for planting week by week. Vegetables like broccoli, cauliflower, Brussels sprouts, and cabbage are ready to be started. When it comes to flowers, some annuals take between 70 and 90 days to bloom; think about sowing petunia, salviaa, snapdragon, and verbena inside as well. Plant outdoors: It’s still early in the season, but there are several plants that can begin growing in March. Make sure that the soil is dry enough then sow plants that are ready to go now, such as peas. By the end of March, eggplant and peppers can also be added to your garden. Weeds: Don’t forget the best part: it’s time to start weeding again! This chore isn’t exactly enjoyable, but it’s a good idea to be on top of weeds as soon as they appear. Instead of cultivating them, pull each weed out by hand to prevent damage to bulbs and roots. Projects: Brainstorm projects you might want to complete over the course of spring and summer, now that warm weather has returned. Think about creating an herb garden if you’ve never had one before. Pick a great spot and stick to it, as herbs return annually. Summer plants: Spring has only recently begun but summer’s just around the corner. Imagine what your yard could produce next season; the sky’s the limit! As soon as you’ve found inspiration, order any bulbs you need, such as dahlias, canna and eucomis.